This knot was popular only in the sport fishing capital of San Diego but later gained widespread recognition with anglers all over the world as an excellent knot. It attaches a line to a swivel, hook, artificial fly or clip. Also known as the reverse clinch or the Heiliger knot it can be tied with many types of fishing lines including fluorocarbon, monofilament and braided v/s the Palomar knot that is not as powerful with braid as it is with mono. It has won rave reviews with fishermen. The below diagram shows the formation of a six turn knot. You would need less number of turns for a heavy line. While tightening in step 4, ensure that the individual wraps do not overlap each other and form a neat spiral. 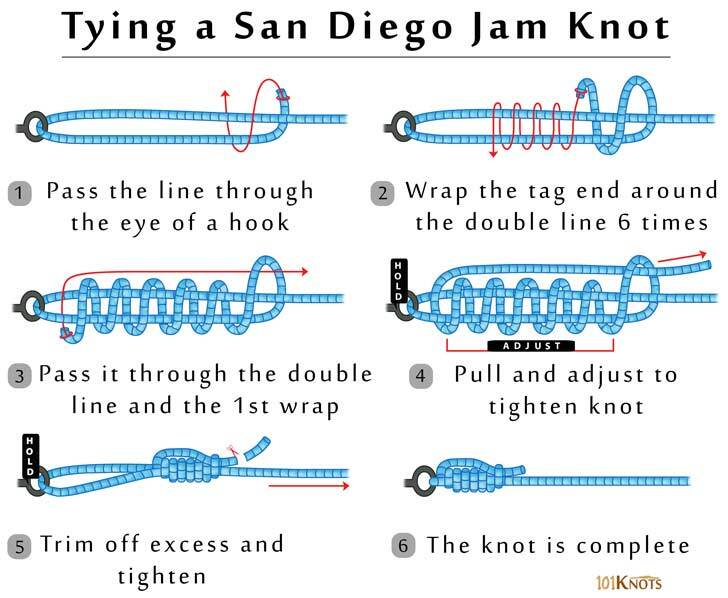 Double San Diego jam knot – It is tied with a double line or bight instead of a single line. When correctly tied, its strength is greater than the uni knot. Quick and easy to tie Not as strong as the Trilene knot as per the outcomes of knot wars. As a drop shot knot. 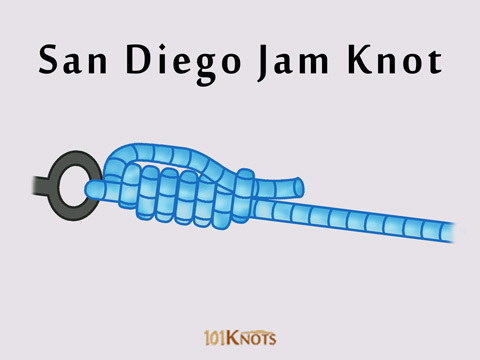 Improved clinch knot – Like the San Diego jam, it slides close to the hook. However, it doesn’t perform as well with braid in which it is slippage-prone. Weaker. Wraps around a single line instead of double. Uni knot – As compared to the San Diego jam that wraps the tag end on the outside of the double line, it is wrapped on the inside of the loop that is created by doubling the line and bringing the tag end back towards the eye of the hook.